Today I got surprise from Algeria. 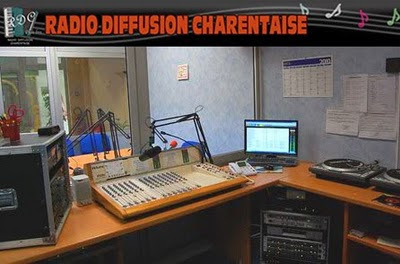 The director of Radio Annaba replied with kind e-mail and verification of my listening. 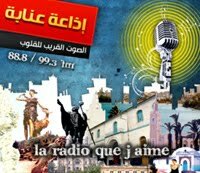 Radio Annaba is a regional station of Radio Algérienne broadcasting on 88. /99.3 and 107.6. I received this station on 88.8 MHz (10 kW). This is Multihop Es, distance 2810 km. Annaba is a city in the northern coast of Algeria, 235 000 inhabitants. / Algeria is my 49th country verified on FM. This year I have collected 232 FM-QSLs so far - from all around Europe !! This is a new Finnish record (was 216) !! The goal is 250, which should be reached as there is two months left. The best country this year has been France with 28 replies. The most difficult country so far seems to be Bulgaria and Turkey (dozens of stations but only a few replies). I have had a lot of nice contacts and some of them goes even to the stations web-page, like with Radio Złote Przeboje (Warsaw, Poland): Story of my reception. Tnx Jakub! - German stations are very kind to reply, especially the big provincial network. You get real QSL-cards from Grmany (Bayersicher Rundfunk Ostbayern / SR3 Saarland, B5 Aktuell)!! This Friday 29.10.2010 I got kind e-mail from Radio City from Maribor, Slovenia. Programme director Bor Greiner (first at right of this morning crew-photo) wrote funny e-mail and verification. 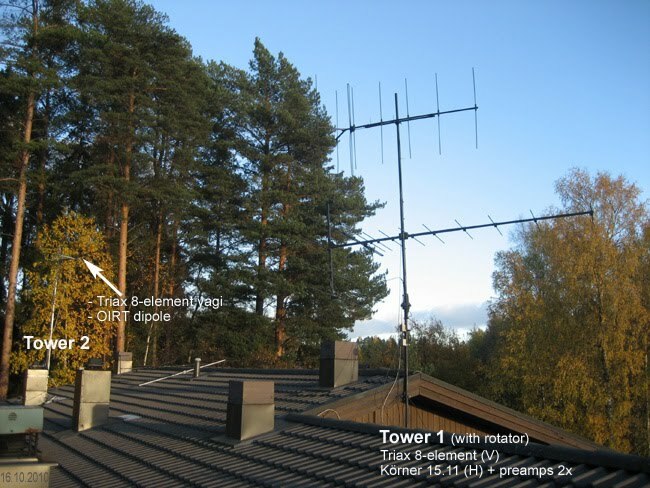 Here a few photos of my antennas in Naantali. There are two little towers, nothing special. Tower 1 is about 4-5 meter high. The highest 2 meters of it is plastic. That's because the vertical antenna is connected directly to the mast. In this way the distance between V and H can be minimal (or could be installed even to the same boom). Everything in tower 1 is painted black, so it is more invisible for neighbors. A few years ago I tried stacking two vertical Triax 8-el. yagis with Triax-combiner but never succeeded. All got weaken for some reason (similar antennas, similar coax-feeds). I am not clever enough to build combiner myself. 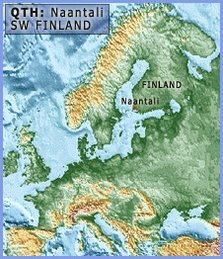 Last summer there were excellent conditions on FM to Europe. I identified hundreds of stations from all around. My distance-record last summer was Radio Darom from Beerseba, Israel on 95.8 MHz, 5 kW, 3380 km (I have QSL). 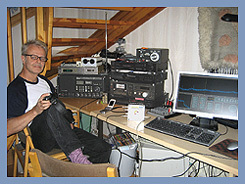 However, I heard also a few pirate stations on FM via ionosphere - from London, Holland and Serbia. 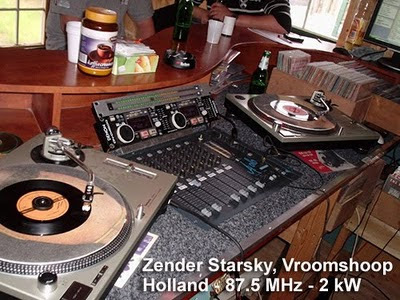 I tuned this Dutch pirate only about 1,5 minutes time on 87.5 with nonstop music, but I was in contact with this pirate and they confirmed my clip (you can hear vinyl-record slow-starting sound in my clip). They sent a few photos of their equipment, too. 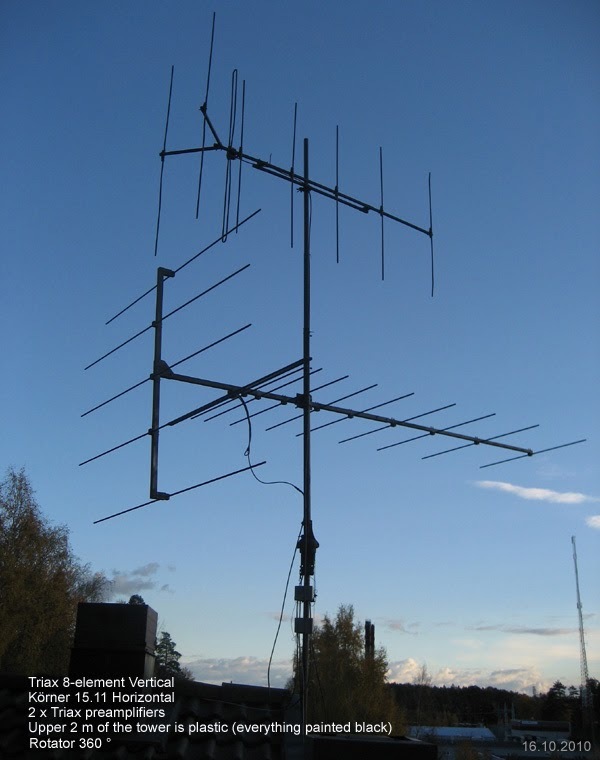 Power 2 kW + antenna gain to 4-element yagi. I have not had time to update this blog since mid-summer. There were so big FM-openings and it took all time to check the recordings! And now I am in the mood of reporting and QSL-hunting! So far I have collected 192 QSL-replies this year!! From now on I will inform here what do I got during the end of this year. 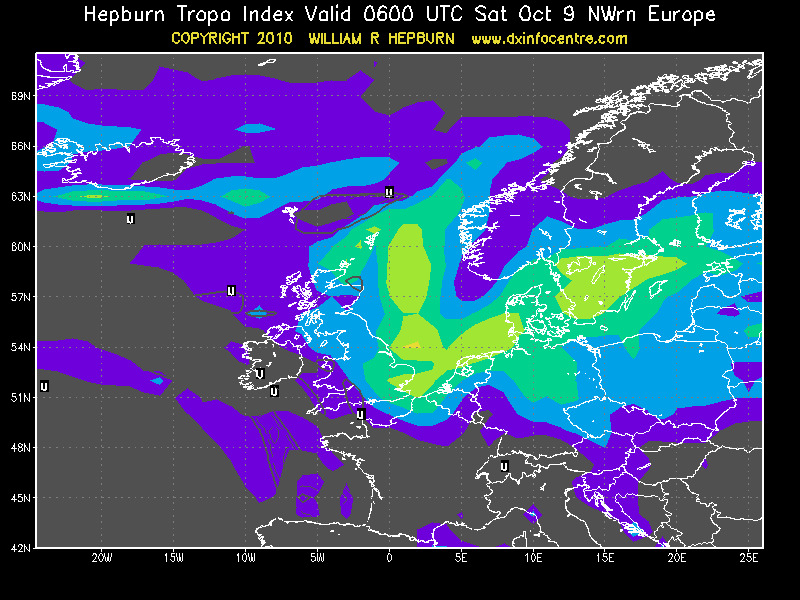 This weekend we had nice tropo opening towards Poland and South Sweden. 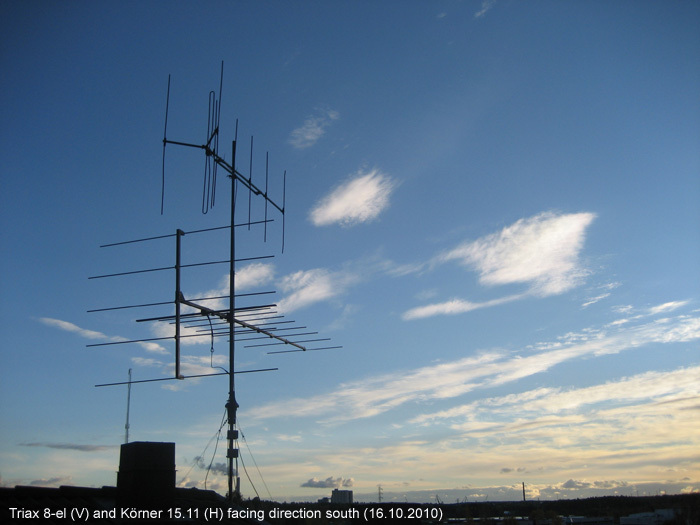 A few new stations were heard by my on Saturday 9.October 2010. 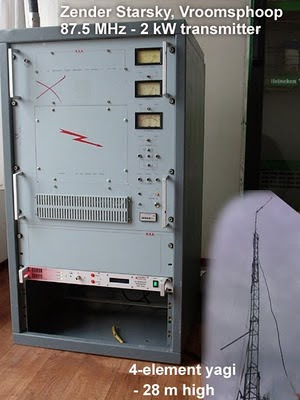 Also a lot of Polish Polskie Radio, Radio Zet and RMF FM trasnmitters from North Poland from Gdynia to Kozalin and Slupsk. Strong signals with RDS! Naturally Danmarks Radio was audible on 96.5 etc. and many MixMegapol and RIX FM regional relays from Southern Sweden (Halmstad, Norrköping, Göteborg etc).